Back to event mode and this time along with Margaryta (@in4Margaret) to share some experiences on working with Microsoft’s Artificial Intelligence platform. As usually happens in these cases, she is the expert and I will only bring my point of view and my experience as a developer using and learning about these services. Margaryta and Bruno as duo will walk through the Microsoft AI platform and capabilities to allow any developer to infuse intelligence into their applications and target entirely new scenarios enabled by the latest innovations in AI. You’ll learn about API’s that provide object recognition, face detection and identification, emotion recognition, OCR, computer vision, video services, language understanding, sentiment analysis and more. They will also demonstrate how you can add customized intelligence to your solution or leverage AI services in conjunction with the Microsoft Bot Service. Vuelta a los eventos y esta vez junto con Margaryta (@in4Margaret) para hablar sobre la plataforma de Artificial Intelligence de Microsoft. Como suele suceder en estos casos, ella es la experta y yo solo aportare mi punto de vista y experiencia como developer utilizando y aprendiendo sobre estos servicios. Microsoft Tech Summit Toronto 2017 has ended and the time has come to share the materials of my presentation. During my AI for the Enterprises session, I did not resist commenting on one of the most sympathetic examples in the world of AI: Muffin or Chihuahua. I strongly suggest to the people to search for this on the Internet, there are serious articles and others not so much about it. The Muffins and Chiahuahuas topic seems to have been very successful because I was almost 45 minutes answering questions after the session (sorry Sabrina for getting late to the next session!). Between the toilet paper story and the muffins slide, I hope that someone of the audience will be encouraged to try and use Azure Cognitive Services. Durante los últimos días he pasado un par de horas jugando con el kit de herramientas. El primer paso es, como siempre la sección Get Started en GitHub. A menos que seas un experto en C++, que quieras compilar los controladores gráficos, quieras aprender OpenCV y mucho mas, te recomiendo empezar directamente con la instalación local e ir a los ejemplos. Importante: Si aun así quieres jugar con fuego, hay una sección de despliegue y compilación para Windows donde se describe todos los pasos necesarios para clonar, compilar y desplegar en modo local. Yo traté de hacer esto y básicamente tiré abajo otros proyectos locales en mi ordenador. Otro punto importante en el toolkit es el soporte de AZURE. Usando una combinación del CNTK y Azure GPU Lab, el equipo de investigación de MS Research creó una plataforma GPU distribuida que puede ser utilizada por la comunidad para avanzar en investigación de AI. Por ejemplo, en un artículo de TechNet, se describe una comparación entre tres otras herramientas computacionales y CNTK. (Torch, Theano y Caffe, como recientemente abierto con herramientas de Google e IBM). Los resultados se exponen debajo y CNTK ha demostrado para ser más eficaz que los otros. So, during the past days I spend some hours playing around with the toolkit. First step is probably to read something about or go directly to the Get Started section on GitHub. Unless you are an expert on C++, you like to compile graphics drivers, you want to learn about OpenCV and more, I strongly recommend to start directly with the local installation and go to the samples section. Important: The setup on Windows section describes all the necessary steps to clone, build and deploy all in local mode. However, I tried to do this, and basically broke other local projects from my own. Another important point in the toolkit is the Azure support. 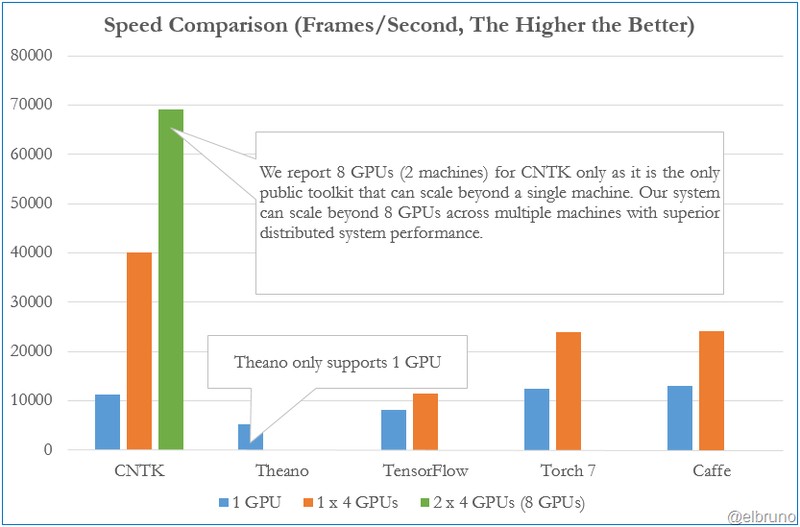 Using a combination of CNTK and Azure GPU Lab, the research team created a distributed GPU platform to be used by the community to advance AI research. As an example, in a TechNet article, they describe a comparison between four other popular computational toolkits and CNTK. (Torch, Theano and Caffe, as just recently open sourced toolkits from Google and IBM). The results are exposed in below chart and, CNTK has proved to be more efficient than the others. Finally, this is not (by far) my main expertise but is something which I really like and also where I really think, every developer must play around and start to know the basis / technology / platform.